My Den: A Magical Ride With Hong Kong Comics...Down Memory Lane. A Magical Ride With Hong Kong Comics...Down Memory Lane. My love for comics started when i was a boy, back in the 70s', where i would visit the many 2nd hand book shops that doted Bras Basah road. Having not much pocket money to actually buy the 2nd hand comics, i would round up a few of my friends and pooled whatever money we had to borrow the comics instead. I remembered it cost about 15 cents to borrow each comic. In this way, i got acquainted with the many super-heroes of the DC and Marvel universes. 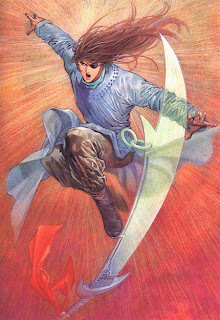 But it was comics from Hong Kong, especially the martial arts genre, that got me really hooked especially the "Dragon & Tiger Gate" series by maestro Tony Wong. In the early 80s' however, a new series "Heaven & Earth" by a new writer, Ma Wing Sing, came into the market and immediately turn into an extremely popular and an overnight hit series. I was hooked by the engrossing story line and enchanted by the superior art renditions. Since then, i have been an ardent follower of this particular comic series from Hong Kong. In fact, i still have all the issues from day one, all kept in pristine condition and it is the only Hong Kong comic series that i had followed into my adult years. The "Heaven & Earth" series focuses on 2 protagonists, "Wind" & "Cloud" (literal translation) and their trials and tribulations in the martial arts world. Woven with rich tales of bravery, loyalty, fight for justice and revenge with the overall theme of human's greed for power, the series captivated me with it's well fleshed-out characters and description of the many ancient and powerful martial arts. Not only was the artwork superior to many before it, it got even better over the years when computer graphics was used in the art renditions. Suddenly from above the mountains, a shadow leaps off a cliff as the tiger pounces onto "Wind". With one smooth stroke of the saber, the shadow severs the tiger head. Blood splashes across onto "Wind" face and spills onto the white snow. * If you like comics, pay a visit to "My Comics Store".